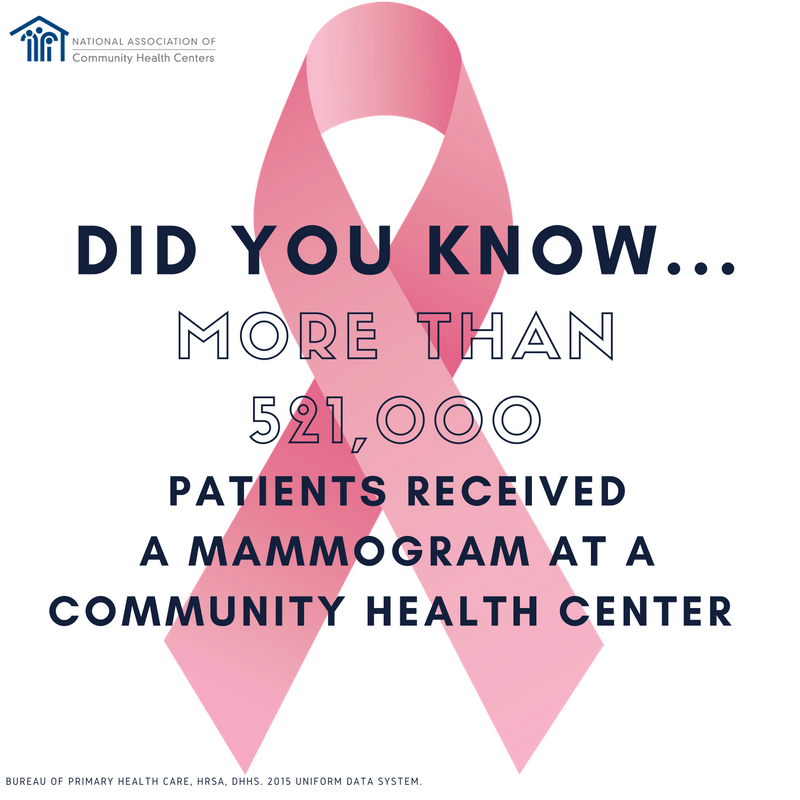 Every October during Breast Cancer Awareness Month we like to take a minute and focus on the important work health centers are doing to fight this disease, which claims the lives of thousands of women every year. About 1 in 8 women born today in the United States will get breast cancer at some point. In 2013 (the most recent data available), 40,860 women and 464 men in the United States died from breast cancer. For the medically underserved and uninsured, gaining access to early screenings for breast cancer can pose an enormous challenge. By providing affordable and accessible screenings and launching education and outreach efforts to culturally diverse populations, health centers have been able to help boost the odds of early breast cancer detection and save lives. 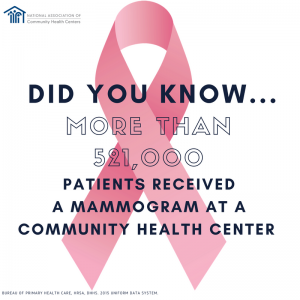 Health centers provided mammograms to more than 521,913 patients in 2015. Over 121,000 women patients were diagnosed with an abnormal breast finding. Studies show that health center patients are more likely to receive mammograms, clinical breast exams, and pap smears, regardless of whether they have health insurance. A case in point is the state of Rhode Island, where health centers have helped to close the disparity gap in mortality rates from breast cancer among African American women, who typically suffer from higher mortality rates. Breast cancer death rates are 40 percent higher among black women than white women. Throughout the month of October, health centers are offering discounted or free mammograms and conducting outreach and education to ensure more women have access to early screenings, which is critical to surviving breast cancer.